PARIS --- Less than three months after it was sealed in October, the merger of the naval businesses of France’s Naval Group and Italy’s Fincantieri is dead in the water, scuttled by the companies’ reluctance to implement a political blueprint that promised few benefits but required costly and complex restructurings. In practice, since the deal was first proposed by Paris as a condition to the takeover of the failed French Chantiers de l’Atlantique (formerly STX) shipyard by Italian shipbuilder Fincantieri, the two companies have continued to keenly compete on export contracts instead of following through on their commitment to make joint bids and to support each other on the export market. 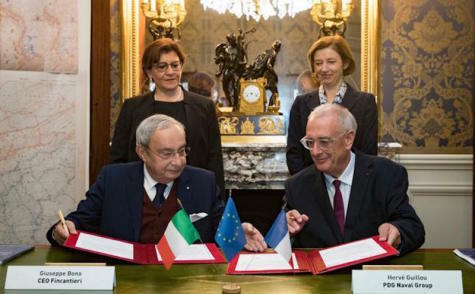 Neither government acted to enforce the agreement, in large part because of the worsening relations between the French government and Italy’s Eurosceptic government of Prime Minister Giuseppe Conte, but also because the strategic partnership signed in Paris on October 23 left too many loopholes. The only advance to date concerns joint shipbuilding programs which began in the 1980s with the Horizon-class frigates and continued in the last decade with the FREMM frigates, neither of which required merged industries. The two companies are currently cooperating on the acquisition by the French Navy of four Logistic Support Ships derived from the Italian Navy’s new “Vulcano,” and built in Italy by Fincantieri. Beginning this year, the two companies are also due to submit a joint offer to upgrade both navies’ Horizon-class frigates by fitting a jointly-developed Combat Management System. The underlying reason for the likely failure of the naval partnership is that it was rammed through before it had been fully thought out. While the agreement covered the metal-bashing aspects of shipbuilding, it ignored the electronic sensors and equipment that can make up as much as half of a ship’s cost, and so left undefined the respective roles of France’s Thales and Italy’s Leonardo, who provide the electronics to both shipbuilders. As Thales owns 35% of Naval Group’s shares, and Fincantieri and Leonardo are both controlled by the Italian state, each partner feared that the other would drive electronics work to its national manufacturer, while Italy feared that, because it wasn’t mentioned in the agreement, Leonardo would be sidelined. To prevent this from happening, Fincantieri and Leonardo in October unexpectedly announced they had “established the guiding principles of an agreement in the field of naval ships that will allow both companies ….. to enhance their complementary expertise ….. to expand their market presence abroad,” this last point a clear shot across the bows of France and Naval Group. France did not immediately react, but on Jan. 8 the European Commission said it “has agreed to the request submitted by France and Germany asking it to look at Fincantieri's proposed acquisition of Chantiers de l'Atlantique in the light of the EU Merger Regulation.” This transaction is the basis for the Naval Group – Fincantieri partnership. In any case, since the European Commission already “considers that the transaction could harm competition at European and global level,” it will probably not go through, which in turn will probably cause the entire industrial construct to collapse under its own weight. Despite the political agreement between the French and Italian governments in September 2017, and the signature of an official agreement on October 26 by both companies’ chief executives, their competition has continued unabated on the world market, generating friction and mistrust on both sides. And this has turned into a war of words conducted through the media. The growing hostility between the two companies seems to have brought to a head in Romania, where both were competing to provide four new corvettes and to upgrade the Romanian Navy’s two Type 22 frigates. According to Italian press reports, France expected to win the competition as Naval Group had filed the lowest compliant offer, worth €1.2 billion, where the Dutch Damen Group had offered €1.25 billion and Fincantieri €1.3 billion. However, the competition was cancelled at the last minute after allegations of corruption were made against Naval Group’s local subsidiary, SNC shipyards in Constanta, which according to French media was a deliberate effort to instead favor Damen’s bid. France fears that Romania could avoid allegations of corruption during its six-month presidency of the European Union by awarding the contract to Fincantieri, which has so far kept out of the fray, especially as its Navy has an urgent need for new warships in light of growing tensions in the Black Sea. If the Romanian competition seems to have brought things to a head, Naval Group and Fincantieri have continued to compete for export orders, and have not yet lodged a single joint bid to date. And the Italian company has not been shy in challenging Naval Group in countries which it considers its own after having won earlier contracts. This is the case in Egypt, where Naval Group has sold four Gowind corvettes, a Fremm frigate and two Mistral-class amphibious ships, and which it considers a major client. Fincantieri has nonetheless made an offer for a second Fremm frigate, but built to Italian Navy standard, as well as two corvettes similar to the Abu-Dhabi-class it has sold to Qatar and the United Arab Emirates, a package financed and insured by the Italian government. But if France complains about Fincantieri, Italian media reports detail Naval Group’s own failings, which Italian officials blame for having lost two major frigate competitions. The first was in Canada, where both companies bid separately before combining their offers in a single bid – but only after the filing deadline for the 15-ship competition had passed, as the Italian news website StartMag reported Jan. 18. In Australia, Fincantieri deplores it received no support from Naval Group for its bid for nine multirole frigates, thereby letting their common competitor, BAE Systems, win both orders for a total of 24 ships with its unproven Type 26 design. Either way, it is clear that each partner distrusts the other, and that once the European Commission blocks the sale of Chantiers de l’Atlantique to Fincantieri there will be little chance of completing the merger. This episode will probably end with the dissolution of the partnership, and possibly the end of France’s stubborn attempts to duplicate the Airbus business model in other defense industry sectors to which it is unsuited.